Since 1992, Marc Ginsberg has been Board Certified in Civil Trial Law by the Florida Bar. 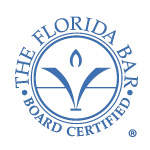 Below, find the Florida Bar’s description of what it means to be Board Certified. Certification is the highest level of evaluation by the Florida Bar of the competency and experience of attorneys in the areas of law approved for certification by the Supreme Court of Florida. Established in 1982 by the Florida Supreme Court, board certification helps consumers identify specialists in various areas of law. Bar certified Florida Bar members are the only Florida attorneys allowed to identify or advertise themselves as “Board Certified,” “Specialist,” “Expert,” or to use the letters “B.C.S.” for Board Certified Specialist on business cards or letterhead, in legal directories or in advertising. A lawyer who is a member in good standing of the Florida Bar and who meets the standards prescribed by the state’s Supreme Court may become board certified in one or more of the 24 certification fields. Only about 4,300 Florida lawyers are board certified. Minimum requirements for certification are listed below; each area of certification may contain higher or additional standards. Satisfactory peer review assessments of competence in the specialty field as we as character, ethics and professionalism in the practice of law. Board certification is valid for five years, during which time the attorney must continue to practice law and attend Florida Bar-approved continuing legal education courses. To be recertified, requirements similar to those for initial certification must be met. Not all qualified lawyers are certified, but those who are board certified have taken the extra steps to have their competence and experience recognized. At Mandina Ginsberg, we focus our practice on referrals from other lawyers who are not specialized in Wrongful Death or Catastrophic Injury cases. We welcome you inquiry as to how we might assist you and your firm get results from your clients. Copyright 2018 Mandina Ginsberg LLC. All Rights Reserved.